Subscribe to a magazine devoted to Kingston’s people. Purchase a subscription today for yourself, or as a gift and receive six issues of Profile Kingston and two issues of Summer in the City. A one year subscription is only $21.99. For delivery to U.S.A., add $30.00. All rates include applicable taxes, shipping and handling. Orders must be pre-paid. Cheque, money order or VISA accepted. Please make all cheques and money orders payable to Profile Kingston. Allow six to eight weeks for delivery. 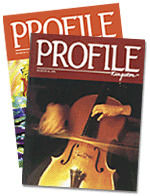 *For a DIGITAL subscription please visit www.Magzter.com for more information. © 2019 Profile Kingston/Summer in the City/Riverview Publishing Inc. No reproduction or republication in whole or part without written permission..
Click here to view excerpts from our current issue. Summer in the City is your essential guide to beautiful, historic Kingston.